Full Color, Custom Letterhead Printing. Need a Free Custom Letterhead Printing Quote or help with your online printing order? Call us at (702) 589-6429 to speak with a Letterhead Printing specialist. Premium Quality, Custom Printed Full Color Letterhead. 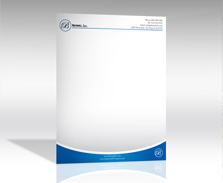 Quality letterhead can mean the difference between a letter getting read or getting tossed! With a wide assortment of high performance water marked and economical paper stock options to choose from, we'll easily satisfy your image conscious stationary and company identity needs. Design your own letterhead or have us create a professional, branded letterhead and identity design for your business. Need a specialty paper or specific brand for your letterhead printing that you can't find online? Just call us for a quick custom letterhead printing estimate. We're always glad to be of service. We also offer matching envelopes. Quantities from as little as 500 pieces up to 10,000 pieces!